Lipotropic Nutrients are compounds that promote the flow of fat and bile to and from the liver. In essense, they produce a “decongesting” effect on the liver and promote improved liver function and fat metabolism. Lipotropic susbstances decrease the deposit, or speed up the removal of fat within the liver. Lipotropic mixtures combine liver and gallbladder therapies in one product, and those using it can benefit simultaneously from the power and potential of them all. Methionine is one of the sulfer-containing amino acids (cysteine and cysteine are others) and is important for many bodily functions. It acts as a lipotropic agent (others are inositol and choline) to prevent excess fat buildup in the liver and the body, is helpful in relieving or preventing fatigue, and may be useful in some cases of allergy because it reduces histamine release. Methionine works as an antioxidant (free radical deactivator) through conversion to L-cysteine to help neutralize toxins. Choline is considered one of the B Complex vitamins as well as a lipotropic nutrient. It is present in the body of all living cells and functions with inositol as a basic constituent of lecithin. Choline appears to be associated with the utilization of fats and cholesterol in the body. It prevents fats from accumulating in the liver and facilitates the movement of fats into the cells. It is essential for the health of the liver and kidneys. Pyridoxine, or Vitamin B6, is involved in more bodily functions than almost any other single nutrient. Vitamin B6 is necessary for the production of hydrochloric acid and the absorption of fats and protein. Pyridoxine also aids in maintaining sodium and potassium balance, hence is beneficial in controlling water retention. B6 deficiency can result in anemia, nausea, headaches, dry skin, fatigue, and impaired memory. Carpal tunnel syndrome has been linked to Vitamin B6 deficiency. Dexpanthenol, or Vitamin B5 plays a vital role in metabolism by breaking down fats and carbohydrates for energy. Vitamin B5 is critical to the manufacture of red blood cells. Vitamin B5 also is important in maintaining a healthy digestive tract and it helps the body use other vitamins more effectively. It is sometimes called the anti stress vitamin because it is believed to enhance the activity of the immune system and improve the body ‘s ability to withstand stressful conditions. Hydroxocobolamin, a unique form of vitamin B12 offers a longer lasting effect than the cyanocobolamin form. Vitamin B12 is needed for normal fatty acid and DNA synthesis. It is essential for maintaining the integrity of the nervous system and the synthesis of molecules involved in the production of energy. Vitamin B12 deficiency can result in fatigue, cognitive impairment, neuropathies and sleep disorders. Let Laurie customize a plan to help you lose 15-20 lbs! Vitamin B12 is an essential water-soluble vitamin that is commonly found in a variety of foods, such as fish, shellfish, meat, eggs, and dairy products. Vitamin B12 is frequently used in combination with other B vitamins in a vitamin B complex formulation. Vitamin B12 plays an important role in supplying essential methyl groups for protein and DNA synthesis. Vitamin B12 is bound to the protein in food. Hydrochloric acid in the stomach releases B12 from protein during digestion. 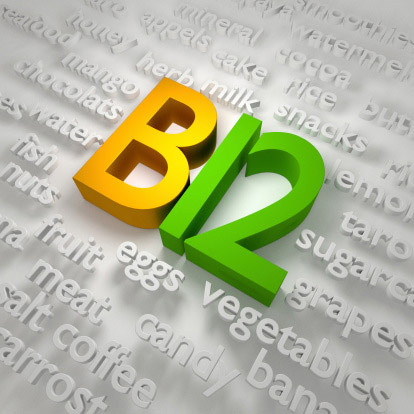 Once released, B12 combines with a substance called intrinsic factor (IF) before it is absorbed into the bloodstream. The human body stores several years’ worth of vitamin B12 in the liver, so nutritional deficiency of this vitamin is extremely rare. However, deficiency can result from being unable to use vitamin B12. Inability to absorb vitamin B12 from the intestinal tract can be caused by pernicious anemia. Vitamin B12 deficiency is common in the elderly. HIV-infected persons and vegetarians who are not taking in proper amounts of B12 are also prone to deficiency.